Recent reports underscore the unparalleled potential of antisense-oligonucleotide (ASO)-based approaches to ameliorate various pathological conditions. However, in vivo studies validating the effectiveness of a short ASO (<10-mer) in the context of a human disease have not been performed. One disease with proven amenability to ASO-based therapy is spinal muscular atrophy (SMA). SMA is a neuromuscular disease caused by loss-of-function mutations in the survival motor neuron 1 (SMN1) gene. Correction of aberrant splicing of the remaining paralog, SMN2, can rescue mouse models of SMA. 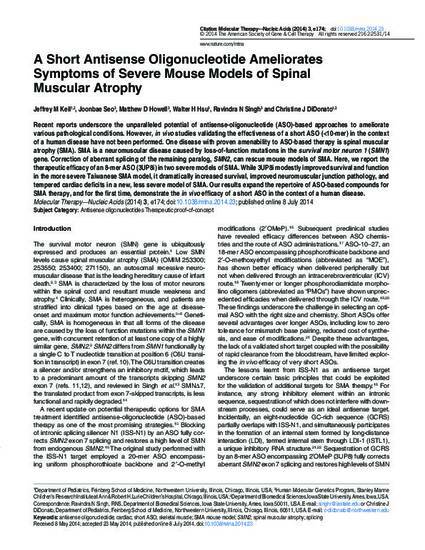 Here, we report the therapeutic efficacy of an 8-mer ASO (3UP8i) in two severe models of SMA. While 3UP8i modestly improved survival and function in the more severe Taiwanese SMA model, it dramatically increased survival, improved neuromuscular junction pathology, and tempered cardiac deficits in a new, less severe model of SMA. Our results expand the repertoire of ASO-based compounds for SMA therapy, and for the first time, demonstrate the in vivo efficacy of a short ASO in the context of a human disease. This is an article from Molecular Therapy—Nucleic Acids 3 (2014): 1, doi:10.1038/mtna.2014.23. Posted with permission.